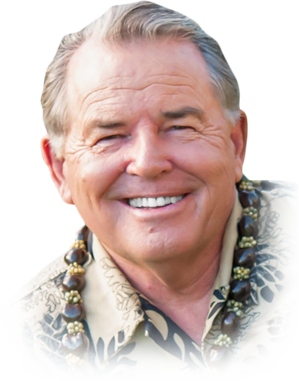 There are fifty miles of white sandy beaches on Kauai with trade winds nearly all year. Winds may shift direction at times providing other surf spots with more favorable (off shore) conditions. 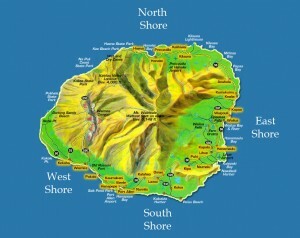 Kauai, known as “The Garden Isle” has been featured in over 50 Hollywood movie productions. Most notably “South Pacific” and “Jurassic Park”. Kauai is loaded with surfing spots, many of which are known only to the locals. All beaches on Kauai are public. Even privatized beaches in front of hotels are accessible via public walkways so you can feel free to explore as much as you want. Although many more less frequented (and “secret”) surf spots exists, the following are most well-known by Kauai surfers. May through October, the South Shore provides consistent South swells for all skill levels. One of the more popular spots is Poipu Beach with a good beginner wave known as “Lemon Drops.” It is far too slow and broad for experienced surfers but perfect for beginners. 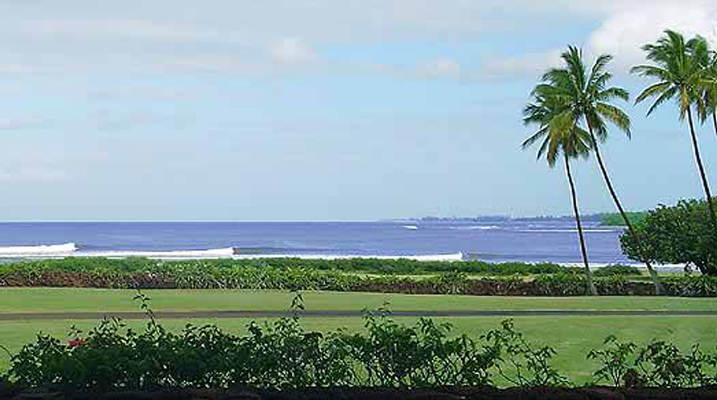 Located in front of the Prince Kuhio condominiums is a spot known as “PK’s”. A good all-around wave with relative easy take-off. Located to the West is “Acid Drop,” “Cows’ Head,” and “Heroins.” These spots are for experienced surfers only. On the southeastern shoreline is “Kalapaki Beach” at the Nawiliwili Harbor. A shallow left and right sandbar break with an easy paddle-out that attracts many beginners and body boarders. More experienced surfers at “Ammonias” on the outside reef. Also on the east coast (among others) is “Kealia Beach” and “Horners” in front of the old Coco Palms Hotel. Popular with both surfers and bodyboarders in the summer. Best known among several West Shore spots just “Pakalas”. (known in earlier days as “Infinities” due to its extremely long left point break). Click here for Pakala video. Surfing on the North Shore is best during the winter months. At the Eastern side of the town of Kilauea is “Rock Quarry Beach” (Kahili Bay). 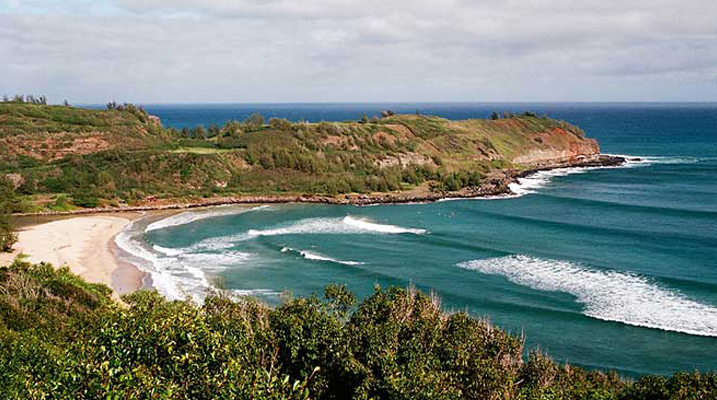 West of Kilauea is “Kalihiwai Bay,” an epic right point break located off the beaten path. Hanalei Bay offers a long sandy coastline with both reef and point breaks. On the South side of Hanalei Pier is “Kiddies” where the waves roll in gently for beginners.